No big surprise here but well worth a mention considering this map pack download not only locked up the server for XBOX Live but the Play Station Network as well, lets hope they keep the add on maps coming at a nice pace. Microsoft today revealed that Activision Publishing Inc.’s (Nasdaq: ATVI) new Call of Duty®: World at War, Map Pack 1 set a new record for number of downloads in its first week of release on Xbox LIVE. Since the launch of the pack, Xbox LIVE members have played more than 150 million multiplayer sessions on Call of Duty: World at War, with friends and rivals joining in the action from all corners of the globe. Developed by Treyarch, Call of Duty: World at War, Map Pack 1 leverages the power of Xbox LIVE to deliver the definitive Call of Duty multiplayer experience, putting players in the action as never before. Players fight through the burning streets of Berlin in “Nightfire” and take up battle positions in fortified Japanese bunkers in "Knee Deep." “Station” offers a bombed out underground train station, and the Nazi Zombies return in “Verrückt” (Zombie Asylum), featuring more weapons, new Perks-a-Cola machines and electroshock defenses. 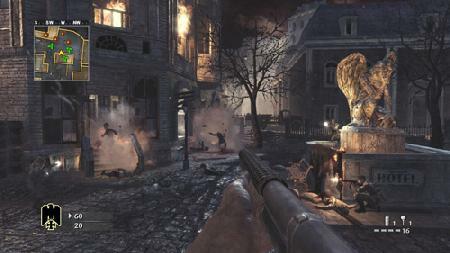 With a diverse selection of new environments, Call of Duty: World at War, Map Pack 1 offers hours of exciting action.